When clients are looking for something never before seen in their neighborhood garden, suggest to them this unique plant. 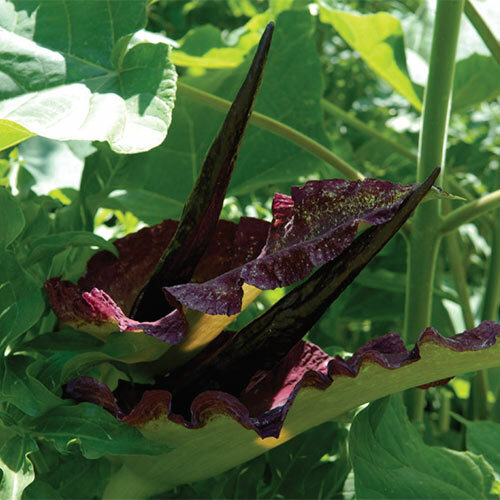 Dracunculus vulgaris is a highly unusual species that features an impressive 20-25" maroon spathe along with a tall, near-black pistil at the center. This perennial plant is a showstopper to be sure, and it is sure to attract plenty of attention no matter where in the landscape it is placed. Though it is fragrant, the aroma is somewhat unpleasant-perfect for repelling deer from the garden. Plant away from entryways or windows where the scent could linger. This true one-of-a-kind plant reliably returns year after year. A good choice for the South. Huge, 20 to 25" spath with a fleshy pistil in each center. Pedate dark green basal leaves (palmate leaves in which the basal lobes are leaflets also).